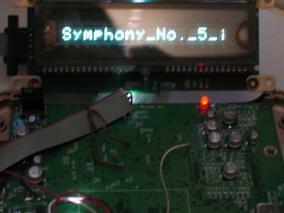 Added Steve's H1 serial port text and images. 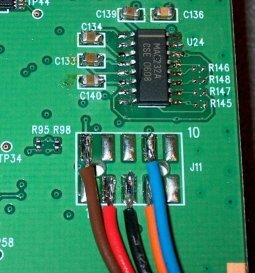 Added another mvpmc user's hardware PDF notes about adding a 3 volt TOSLINK interface. Added section to track MVPMC IR Blaster effort. 4. Is there really a serial port on this box? 8. What is a VFD and or LCD? 10. Another user's hardware notes (PDF). The MediaMVP has some hidden talents that are not part of the out of the box" offerings. First, we can add a digital output much like the one many DVD players sport. Second we can add a serial port which turns out to be the consul at boot up. To this, we can connect a local display such that we can see what's playing. Many thanks to the likes of BobTheBuilder and other's who hang out at shspvr.com/forum! 2. What is SPDIF and / or TOSLINK? SPDIF is a standard which can transfer audio and data streams over a 75 ohm cable in a digital format. For details search on these standards: IEC958, IEC60958 and IEC61937. TOSLINK usually refers to the optical version of SPDIF. Hold it, before taking another step, be aware that opening your MediaMVP box will probably void the warranty and making alterations will certainly void the warranty. The HOWTO and MVPMC Code authors and contributors are not responsible for any damage caused to your MediaMVP box, to anything you connect to your MediaMVP box or to your self. Now that you feel totally on your own let's get started. Seriously, if you haven't worked on static sensitive digital circuits before this may not be the right project for you. Taking static precautions is just one of many procedural steps we are going to assume you already know about. The only topic that will be covered here is what has worked for other people with reference to adding a SPDIF interface. If you would like to emulate what they did, that will be up to you. The SPDIF signal is already available inside the MediaMVP. 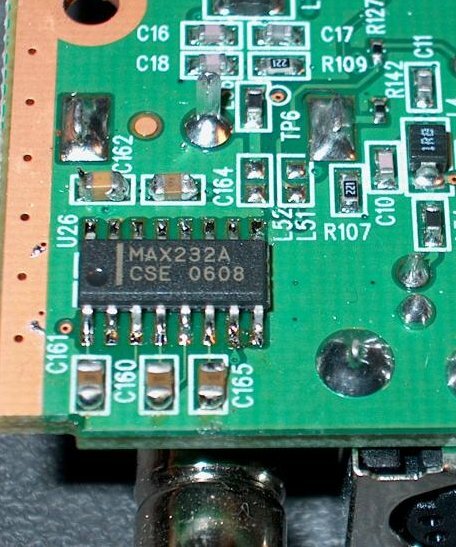 Locate TP60 by matching up the pattern on your printed circuit board with the picture below (in this image, the front of the MediaMVP is to the left). TP60 is where the capacitor is connected to the circuit board near the center of the photograph (use a small gage wire for this - probably at least AWG 30). Click on the picture for a larger image. Thanks goes to BobTheBuilder for figuring out these particulars and for this picture. 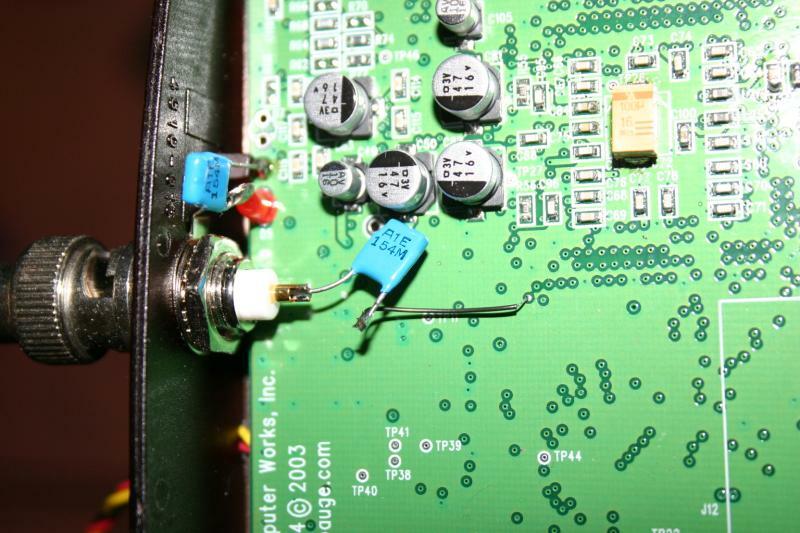 The SPDIF signal flows through this capacitor and onto the center of the SPDIF connector. 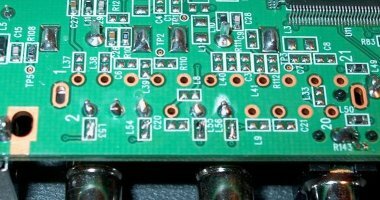 The other capacitor is used to AC couple the SPDIF connector's shielded side to ground. Note the pad just above the power LED should be a ground. This alteration is for an electrically connected SPDIF port. 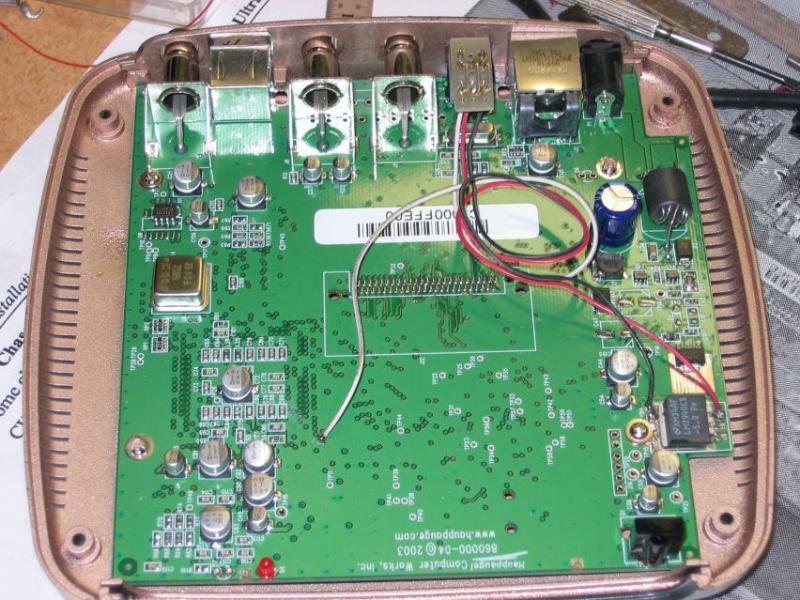 Note the modification uses 2 capacitors to isolate any DC component of the signal on both the signal and the ground reference. 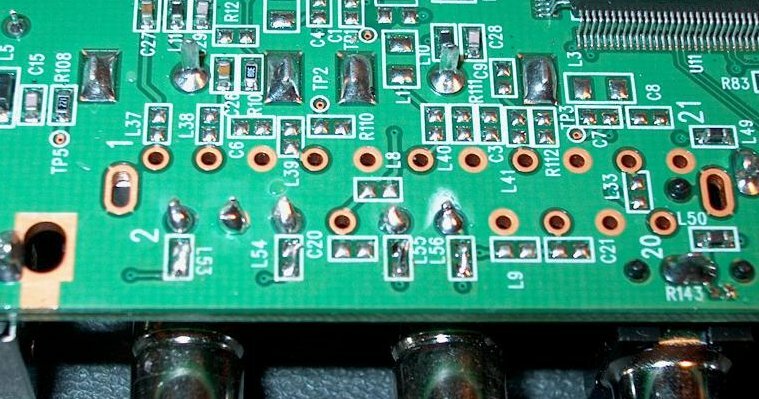 In this alteration, the capacitors were each 0.1 uF ceramic discs. This alteration uses a BNC connector. This type of connector mounts solidly and makes secure and dependable connections. Most home equipment will, however, use RCA connectors and cables. Here's a circuit diagram in case you really need one. In a similar fashion one can add an optical TOSLINK. 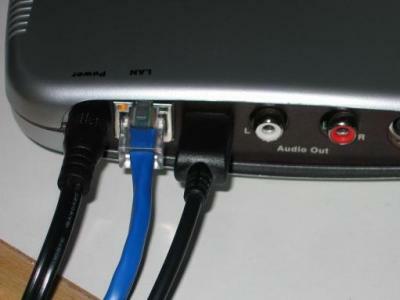 In the image below the TOSLINK connector is located near the top (at the back of an MediaMVP) between the Ethernet and left audio ports. The connector is mounted up-side-down and covered by a small circuit board so as not to solder the wires directly to it's pins. The white wire is connected to TP60, the red to the regulated +5v side of the power regulator IC and the black to the ground tab of the power regulator IC. These TOSLINK connectors have a small circuit inside to drive the LED which is the reason they require a power connection. Note the SPDIF signal at TP 60 is probably a 0 to 3 volt signal and this alteration works despite the TOSLINK being powered at 5 volts. Please take a look at the specifications of the TOSLINK connector / adapter you will use to make sure there will be no problems. Yes! But it is missing a chip and some capacitors. It turns out that this is the operating system's console. It comes in very handy for debugging. But we are mostly past that state thanks to the efforts of the developers here. On the bottom of the circuit board, there is a "target" for a MAXIM MAX562 chip. There are also 6 capacitors missing (if I remember right). The MAX562 link should take you to a MAXIM web page which has a Typical Operating Circuit diagram on it. There you can find appropriate capacitor values. In the picture below all these parts have been installed. Evidently the pads inside the white box to the right were for a serial port header / connector. In this image the black wire is connected to ground. This would go to pin 5 of a DE9 female serial port connector. The red wire would go to pin 3 of the same connector. And the yellow would go to pin 2. Thanks again to BobTheBuilder for pointing the rest of us in the right direction and for this picture. The MVP revision H1 has a slightly different circuit for its serial console port. 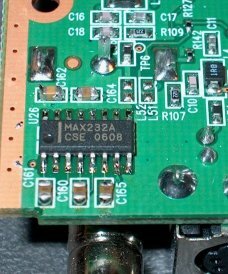 The chip required is a MAXIM MAX232ACSE, and the 5 0805-size capacitors should be 0.1uF. Note that a MAX232 chip will probably not work; the "A" suffix version is required. The pads labeled J11 are numbered correctly for wiring to a DE9 serial connector wired as a DTE. The MVP revision H1 has a chip location for a second serial port, which can be accessed as /dev/ttyS02. Required parts are another MAX232ACSE and 5 more 0805-size capacitors. This serial port is wired to the SCART connector pins through tiny inductors. 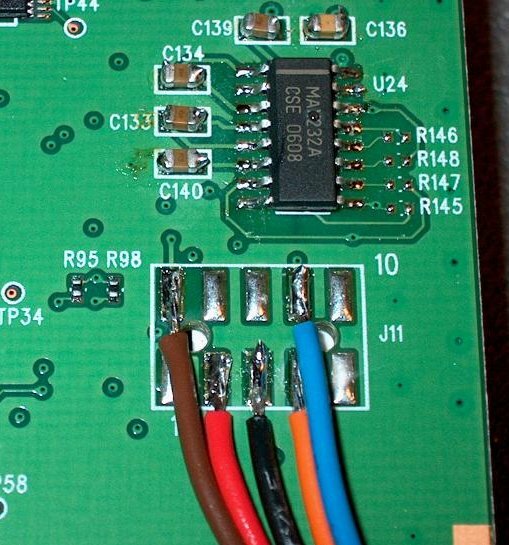 For a factory-correct version of this hack that might pass RFI emission testing, suitable inductors must be installed. Otherwise, the board locations labled L53, L54, L55, and L56 can be bridged with a tiny wire. 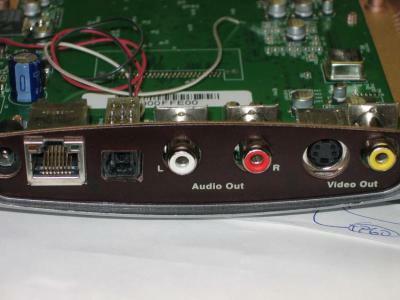 In North American variants of the MVP, the SCART connector is not installed, so wires from a DE9 connector can be soldered into the empty holes out to a DE9 connector. VFD stands for Vacuum Fluorescent Display. Just about everyone knows that LCD stands for Liquid Crystal Display. The main differences are that VFDs generate their own light (usually a bright blue), can be easily read at different angles, operate over a large temperature range and can be viewed in bright light. LCDs are passive (unless back lighted), and have contrast problems at different angles and temperatures. For portable battery operated devices LCDs wins hands down as they only take a fraction of the power to operate. But for our application, I prefer VFDs. Here is a rather small VFD (1 row x 16 characters) connected to the serial port of a MediaMVP running modified MVPMC code. This particular unit is an used IEE VFD with a parallel interface. The reseller included an Atmel processor base serial to parallel board which makes it ideal for the MVPMC project. Click on the image to download / view an AVI video of the display in action. And here is a larger VFD (2 rows x 40 characters) connected to the same serial port as above. Interestingly, I can use the same Atmel processor base serial to parallel board for both IEE displays. Note, the larger display has 2 extra pin and the pin-out is reversed so the Atmel board needs to be plugged in up-side-down. Click on the image to download / view an AVI video of the display in action. Yes, there are more details that I didn't include. But I assume most of you are experienced at this sort of thing and would be over come by boredom if I dribbled on about how hard this was or easy that can be. However, if I missed something, use the e-mail at the top of this page and I'll try to update this HOWTO accordingly. Thanks again to BobTheBuilder for his efforts and pictures. I'm going to drop in some IR remote control links here just to keep them around. Also, I'm going to suggest that the mvpmc be used as an IR Blaster. The first and simplest objective to this effort is to get rid of the TV remote control (i.e. be able to use the mvpmc's remote for both the TV and mvpmc box).